This is very strange. 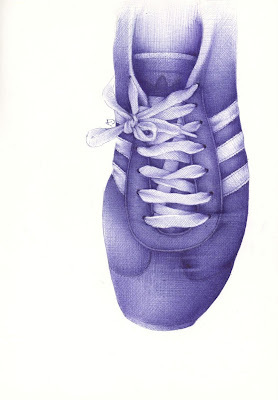 Not that I'm drawing shoes, trainers to be specific, in ballpoint pen. That's probably pretty predictable. What's strange is using somebody else's pc and somebody else's scanner. It all looks so strange. I have no idea what the quality of this scan looks like to you, but it's not looking great from where I am sitting. Which is in somebody else's chair. Still feeling a bit blue about my scanning issues. But shoes always seem to cheer me up. View my shoe collection HERE. You just amaze me with your art. You have such a wonderful talent, if I could draw 1/4 as well as you I would be on cloud nine! Looks perfect to me! Possible a slightly lower resolution scan but it may just look different on their screen because their screen and yours have a different colour balance or something. Looks great to me! Love the texture. excellence as we've come to expect! if you need to borrow a scanner, you can use mine. it's starting to act up, maybe if it had some quality art run through it, it may work better. hope you can resolve your technology issues soon. I don't think I understand my scanner, and never have...add photoshop with pixels and size and man...I am so confused. Last year I bought a Brother all in one that's able to scan up to leger size, but of course the fax ring escapes me...sounds just like the phone. Maybe I should rent a geek. I've been meaning to do it for a while. Great drawing...who says we need lots of materials to do amazing work...this is perfection! I've excitedly added you to my blog roll; you and Suzanne...thanks for kind comments. I have no scanner help to offer but I do love drawing with a blue ball point pen! I can get a better variation of tones with a bic pen then I can with a decent pencil, what's up with that? I hope you get your scanner issues resolved so we can see more! I'm still floored about what can be done with a ballpoint pen. Your shoes are great - I love the variety you've done! Your lines are getting more refined and more refined with each drawings. I swear I do not know how you draw such beautifully straight lines. I can't even walk in a straight line let alone draw one! You rock, my friend. Thank you all folks. I've been a little distracted recently but it's back to business now. I appreciate you continung to visit and taking the time to comment. These look awesome from where I'm sitting! In front of my Mac. I think all colors look better on a Mac screen! I just finished going thru your flickr pages (all 36 in the first group) and I really love your style! What brand of color ink pens do you use? You never seem to have a clog or a blob on your drawings! Awesome paint!!! I cannot believe, how you can draw so beautiful with simple pen!!! ?